The 40 Bb. Pilipinas 2011 Official Candidates are here! Posted in: 1 Pageant Pages. Tagged: ABS-CBN, Bb. Pilipinas 2011, Bb. Pilipinas Universe, Bb. Pilipinas-International, Miss International 2011, Miss Universe 2011. Owing to the fiercer quality of applicants this year (with four more added to the Top 50 at the last minute), BPCI decided to up the number of annointed candidates and make the 2011 pageant more exciting. Did your favorites make it? Anyways, these forty ladies will vie for two (2) major titles – Bb. Pilipinas-Universe and Bb. Pilipinas-International – which will earn them the right to represent the Philippines in the Miss Universe 2011 in Sao Paolo, Brazil and Miss International 2011 in China, respectively. The real competition starts right now. The Bb. Pilipinas 2011 Coronation Night will be held on April 9, to be aired over ABS-CBN. Will Dianne Necio finally win the crown this year? Posted in: 1 Pageant Pages. Tagged: Bb. Pilipinas 2010 First Runner-Up, Bb. Pilipinas 2011, Dianne Necio, Miss Universe 2011, Venus Raj. Last year, Dianne Necio tried her luck for Bb. Pilipinas. She landed First Runner-Up. 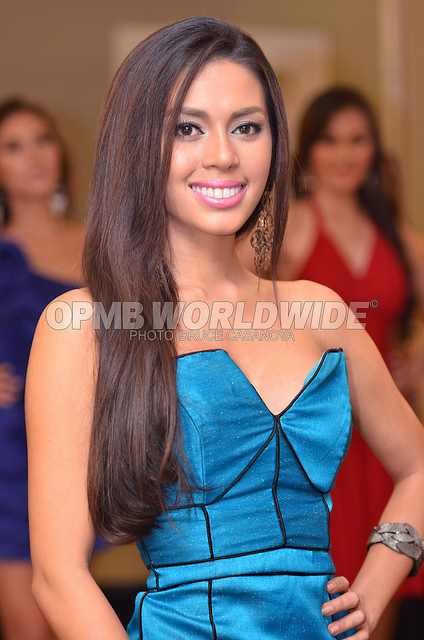 Not contented with placing next to the Queens of 2010, she is more determined than ever to nail a crown that eluded her. And believe me, she wants the top spot and become the Philippines’ representative to the Miss Universe 2011 in Sao Paolo, Brazil. The 24 Official Candidates of Bb. Pilipinas 2011 will be announced tonight (wee hours of the morning of January 30 if you will). And Dianne is a shoo-in to make it as one of them. Posted in: 1 Pageant Pages. Tagged: Angelia Ong, Arabella Hanesh, Bb. Pilipinas 2011 Top 50, Bruce Casanova, Camille Alexis Baltazar, Carl Crystle delos Reyes, Carla Lacson, Carolyn Ty, Christine Adi, Dane Umali, Diana Arevalo, Dianne Necio, Dindi Pajares, Elizabeth Clenci, Gianna Therese Quintos, Girle Lero, Glennifer Perido, Grendel Alvarado, Hazelyn Santos, Isabella Manjon, Jaine Hidalgo, Janine Tugonon, Jenette Mieko Noguchi, Jenilyn Olivar, Jenn-Roe Gubat, Jennielyn Natividad, Joana Tuazon, Kathleen Subijano, Kenneth Dimaapi, Krystle Ann Grant, Ladylyn Riva, Lara Marcelo, Luzelle Felipe, Ma. Kristina May Marasigan, Ma. Paula Bianca Paz, Ma. Zhareal Oliveros, Marish Alyssa Marquinez, Martha McCulley, Mary Jean Lastimosa, Monique Teruelle Manuel, OPMB Worldwide, Patricia Tumulak, Paula Camille Figueras, Queenierich Rehman, Renee Hassani, Roxanne Cabanero, Sabrinne Al-Tawil, Samantha Purvor, Sarah Clenci, Shamcey Supsup, Teresa Pamela Ludovice, Wendy Lucas, Zephorah Mayon. All the videos below are courtesy of OPMBvids and made possible by Bruce Casanova of OPMB Worldwide. Kish sale starts tomorrow and lasts only for 3 days! Posted in: 2 Shout-out-Looks. Tagged: Kish Sale, LRI Design Plaza. I love Kish. The designs are so chic and cool. And to hear that they will have a 3-day sale lifts my spirit up. Tomorrow (January 28) till Sunday (January 30), their once-a-year sale starts. If you love Kish, then you better find time to drop by this weekend. Posted in: 1 Pageant Pages. Tagged: Bb. Pilipinas 2011 Top 50, OPMB Worldwide. images courtesy of Bruce Casanova of OPMB Worldwide. There are fifty (50) shortlisted ladies right now vying for the 24 Official Candidates slots of Bb. Pilipinas 2011. Above are ten of the wannabes I’m liking so far. Will they make it to the two dozen hopefuls come Saturday? Posted in: 1 Pageant Pages. 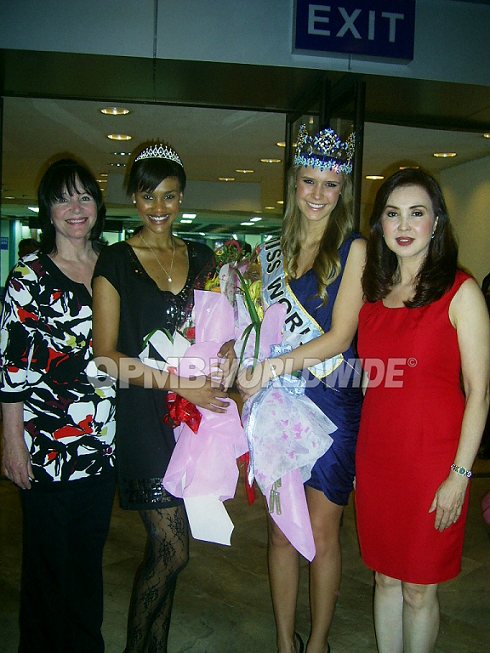 Tagged: Alexandria Mills, Cory Quirino, Emma Wareus, Julia Morley, Miss World 2010, Miss World Limited Inc.. Here for the contract signing of the new franchise for Miss World-Philippines are the indefatigable Julia Morley who heads Miss World Limited, Inc., the reigning Miss World Alexandria Mills from the USA and her 1st Runner-Up Emma Wareus from Botswana. Franchise owner Cory Quirino warmly welcomed the group and made sure that their short stay in the country is memorable.